Back-Up Story: "The Origin of The Penguin"
In Earth-8's Slovakien Royal Palace, Lord Havoc's legion delivers the unconscious Donna, Jason, Jokester, Kyle Rayner, and Monitor "Bob" to their master's feet. Intrigued by their abilities being unlike the native Meta-Militia members, Havoc plans to extract information from them before destroying them. However, unbeknownst to them, he's being watched by a Monitor, who grabs a gun and teleports away. In Metropolis sewers, Jimmy has returned to normal following his power overload at STAR Labs... in his boxers. He is discovered by the Newsboy Legion, who have long known that "Mr. Action" was really Jimmy. They�offer him sanctuary until he can get a better grip on his abilities, which Olsen gladly accepts. In the Agean Sea, armed with a spear, Holly does aquatic battle with a gigantic sea serpent as part of a training exercise to earn her spot on Themyscira. When shark-like monsters appear from nowhere, Holly is inspired by common knowledge about sharks and blood and deduces that serpents have the same nature. She spears one of them so as to distract the monsters with the blood while the others can make their escape. At first Holly thinks Harley Quinn didn't make it out, but then she surprises them all by not only surviving but also hoisting one of the serpents' heads mounted on her spear above her. Under Eclipso's dark influence, Mary has taken one extreme situation and turned it into another by flooding the drought-suffering farming village of Vizce, Turkey. Not only does she get off on the fear and carnage she has caused, but finds their pleas to stop the rain as insults. Since they claim that as farmers without the livestock they'll starve, she uses her newfound magic to turn drowning cattle into fish so as to solve their problem. They reluctantly accept after Mary threatens to turn them into fish as well if they refuse. Eclipso is pleased with her and tells her a few more lessons are in order before she is ready for some unknown purpose. Back on Earth-8, Havoc is impressed at how resilient most of the heroes are in the face of their torture methods. However, he wonders if they're holding out on what they're doing here or if they truly don't know. One of his minions reports a breach in their security. In the Norad Storage Hangar Facility J-318, before Brother Eye, Val wonders the meaning of "The Great Disaster has come to you," as to whether he is the source of this disaster and if he can be cured. Brother Eye becomes offended by Val's insults and is tired of only being sought after when people need something of it. It overrides security settings and tries to permanently confine Val, Una, and the others with him forever. Suffering from both the overbearing overprotectiveness of a mother that made him take an umbrella to school every day, and the taunts of other school kids because of that as well as his bird-like nose and weight problem, Oswald Cobblepot came to appreciate the company of the birds in his mother's pet shop to people. As an adult, he gravitated to acquire other kinds of birds... the expensive kind. Taking on a life of crime as the Penguin (his childhood nickname), put him in direct conflict with the Batman. Where once his Iceberg Lounge was a front for black market activity, Penguin has reputedly gone legit to the public eye. However, he still sells overpriced criminal merchandise in order to make up the lounge's two-thirds of the profits. Main Story - 4: This issue is made up of two-thirds darkness, and that's what I want to talk most about today. The behavior of the once-squeaky-clean Mary Marvel was a real shocker, but not surprising considering a) her teacher, and b) the influence of the Black Adam powers. There's not an ounce of regret in this tarnished hero's mind. For me, Dini is trying to illustrate innocence corrupted with Mary's journey. Then there are the adventures of the heroes in search of Ray Palmer, and the recent loss of Jokester. Though not really that much of a page-turner,�his demise�serves to demonstrate that nothing is off limits in this series and not everyone�gets out alive. The Monarch is still much of an enigma to me, as to his agenda and motives for wanting to eliminate the�Monitors. I have a hunch about what's under that mask but for now�I'll keep my theories to myself. 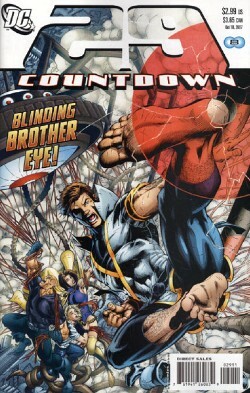 The return of Brother Eye from the OMAC storyline and its relevance to the fate of the Karate Kid (sorry I can't help�but think of Pat Morita when I hear that name) is a great idea�on Dini's part because it leaves room for Batman to make more appearances since it is truly Bruce's greatest mistake. Still there are some humorous parts in it, such as Harley Quinn. Now I'm still in the dark as to whether superhuman strength was one of her abilities she got from Poison Ivy, but it'd take a lot of weightlifting to hoist a twenty-pound�head like that one over�your head. It's cool to see the Newsboys Legion again, certainly after reading "The Death and Return of Superman Omnibus." Time will tell however if Jimmy's abilities will get even weirder and more uncontrollable, thus posing a threat to the kids. Then there's the Piper-Trickster�story. They seem like the costumed versions of Ando and Hiro from NBC's�"Heroes" to me; classic Abbott and Costello-like characters who keep finding themselves getting deeper and�deeper into danger as they continue to run. The way those two are make you�want to ask them "How do you survive out here?" With the addition of Double-Down not only do we get a new plot development�but a new foil to add to the group. So in a nutshell keep up the good work�Paul. Main Art - 3: This week the artwork didn't really stand out for me. The only exception were the dark depictions of Mary Marvel because again it's such a departure for the character, especially in light of the latest Shazam! miniseries in which we see her beginnings. Aside from good depictions of Jimmy and Green Lantern, this issue lacked the punch that it deserved. The death of Jokester could've been handled a litte better than have him take a shot in a regular sized panel and him dying in a panoramic longshot below. Don't get me wrong it was good art but bad breakdowns (take notes Keith). Back-up Story - 4: Beatty for one did a great job in cramming pre-crisis, post-crisis, and post-infinite crisis backstory into this version of the Penguin's origin. I'm so glad that this isn't the Penguin from "The Batman" animated series because this Cobblepot has one advantage: class. I have to admit having two strikes against him (sheltered life and his deformed nose) is reason enough for anyone to go counter-culture for some payback. The attachment to birds, however, is a new one for me because I always felt the fact he needed a gimmick and chose to only steal bird-related artifacts or treasures was reason enough to explain the bird motif. It gives Oswald a totemistic quality buried beneath the plethora of suits and parasols. Good job all in all Scott. Back-up Art - 5: First off, no one can draw Batman villains like Scott McDaniel, and the Penguin was no exception. The breakdowns of the origin serve to give a broad overview of his early life. However, some of the scenes before Penguin is seen in full regal seem a little wasted, possibly because better angles could've been implemented. Still seeing Ozzy in his old tuxedo, then buried by beautiful women in his lounge works in the sense that it gives off the message "look at me now." I miss his work on BATMAN and NIGHTWING, and it's good to see he hasn't lost his touch. Cover Art - 3: This gets a low mark because it has NOTHING to do with the main plot of the book, which is the capture of the heroes. Still very good composition.